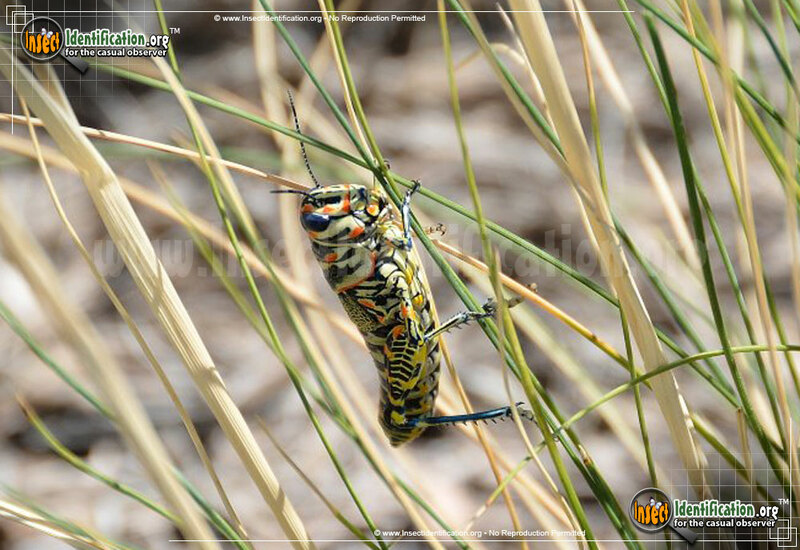 Detailing the physical features, habits, territorial reach and other identifying qualities of the Painted Grasshopper. Showcasing the colors of a summer sunset, it seems fitting that the Painted Grasshopper is native to the western part of the continent. The multicolored Painted Grasshopper goes by many names, each attempting to be as descriptive as words allow for such a spectacle. Rainbow Grasshopper, Pictured Grasshopper, and Barber Pole Grasshopper are a few examples. Regardless of what they are called, they sport magnificently detailed patterns all over their bodies. The head has hues of orange-red while the abdomen is yellow. The legs have a chevron pattern on the sides while the abdomen has bands. Small wings cover the middle of the body. This species is active from spring through half of autumn. Eggs laid late in the fall overwinter and emerge as adults in the spring. Two generations can be produced each year in warmer regions. Look for Painted Grasshoppers in brush, grasslands, chaparral, prairies and deserts with a little vegetation.